Here's humorous proof of just how fun it is to observe with your ears. A whimsical introduction to pitch and volume, this book practically begs young scientists to read it aloud. And why not? It s the best way to compare the differences among a telephone s high ring, a cow s low moo, a fire truck s loud clang, and a flying string band s plinkety plink plunk. Sounds Are High, Sounds Are Low is ideal for beginning readers and hilarious practice for future sound effects pros. 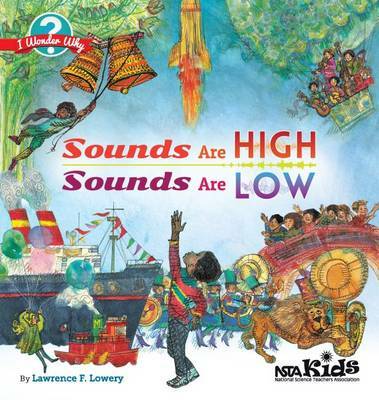 Sounds Are High, Sounds Are Low is part of the I Wonder Why book series, written to ignite the curiosity of children in grades K 6 while encouraging them to become avid readers. These books explore the marvels of light, color, machines, sound, and other phenomena related to physical science. Included in each volume is a Parent/Teacher Handbook with coordinating activities. The I Wonder Why series is written by an award-winning science educator and published by NSTA Kids, a division of NSTA Press.